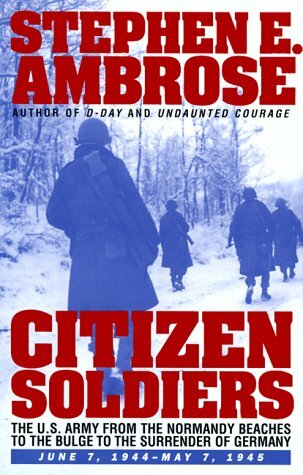 This is the only Stephen Ambrose book I’ve read, spurred on by recently rewatching Saving Private Ryan and Band Of Brothers. A look at the American soldiers in the European theatre from D-Day to the end of the war, the book is based on oodles of research and countless memoirs, oral and written, from the people who were actually there. It doesn’t go into the actual events of the war in any detail, so it would behoove readers to have some background knowledge, but Ambrose does a decent job of sketching out the general situation. Technically, this book should have been easy to whole-heartedly recommend. Ambrose has sewn together an extremely important collection of memories, thoughts and feelings of the troops on the front lines of the last war, allowing the people who were actually there to tell their stories. Whilst some have criticised the relative paucity of attention to the other Allies, other theatres, the Germans etc., that is precisely because they fall outside this book’s remit. Concentrating on the written and oral memories of US soldiers, Ambrose nevertheless weaves them into the course of the war, so even people relatively unfamiliar with events on the Western front should not get lost. One particular strength of the book is its organisation. The different campaigns during the war are dealt with separately, as one might expect, but there is also a whole part dedicated to different groups and aspects of the war. It is very welcome that chapters are dedicated to such oft ignored facets as the ‘Medics, nurses and doctors’, ‘Prisoners of war’ and especially a chapter on the uglier side of war, on the criminals, profiteers and racists. Aside from these specific chapters, there are plenty of other interesting titbits of information scattered throughout the book, such as the reports of dud ammunition (sadly not researched, but backed up in a letter to the author from a Jewish slave labourer in a German concentration camp in the afterword), the fanaticism of some of the SS troops (one is mentioned dying after refusing a transfusion from a US medic, on the chance it might contain Jewish blood), or the German soldier executed for spying when caught with forged papers (the original reading “Not a Pass–For Indentification Only”, and the forger having corrected the spelling mistake). Sadly, for all this the book is not without its flaws. Another reviewer, when trying to come up with a single word to sum up the book decided on ‘frustrating’, and I think this rather hits the nail on the head. This book is well written, well compiled, well researched, but unfortunately it isn’t a great piece of history, when if very much should have been. Ambrose writes with an agenda, one that is seldom disguised, seldom explored, rarely supported. He seems to have a personal vendetta against Montgomery, and on numerous occasions quotes sources to the effect that he was responsible for much of the mishandling of the war effort. Granted, the work is entirely concentrated on the US army’s endeavours, but such focus is also combined with a very dismissive attitude to the soldiers of the other nations. The one great hypothesis that Ambrose seems wont to flaunt is that the greatest capitalist democratic economy simply produced the best soldiers in the world, despite the very same book deriding the army’s lack of training, the system of replacements, the ignorance of the army commanders, the poor or unsuited equipment etc. Given the otherwise relatively sober portrayal of events from the eyes of those who fought, such jingoist conclusions are unfitting and unnecessary. Rumours of plagiarism aside (Ambrose states clearly in the introduction that his aim was to “let [his] characters speak for themselves by quoting them liberally”), there is also call to believe that some of his quotes are taken well out of context to further his agenda. I don’t believe for a second that this is particularly warranted, but his openly opinionated comments unfortunately lead to such nagging suspicions. Finally, there were apparently also numerous obvious inaccuracies in the book, the sort of figures and facts which most WW2 enthusiasts soon spot, and which also detract from its overall image (I think these errors were corrected in the version I read, which included an afterword dealing with the many letters the author had received). Ultimately, as a testament to the people who fought, this book is an important and engaging work, and well worth reading for anyone with an interest in the Second World War, the US army, or wartime and soldiering in general. It is well organised, well structured and relatively readable, despite occasionally having too many different opinions and quotes tied into a handful of paragraphs. The accompanying maps and pictures are also a welcome complement to the stories and eyewitness accounts. But unfortunately the author’s reputation and his rather opinionated style detract from all of this, and leave something of a sour aftertaste to what is otherwise a very mature and sobering story.